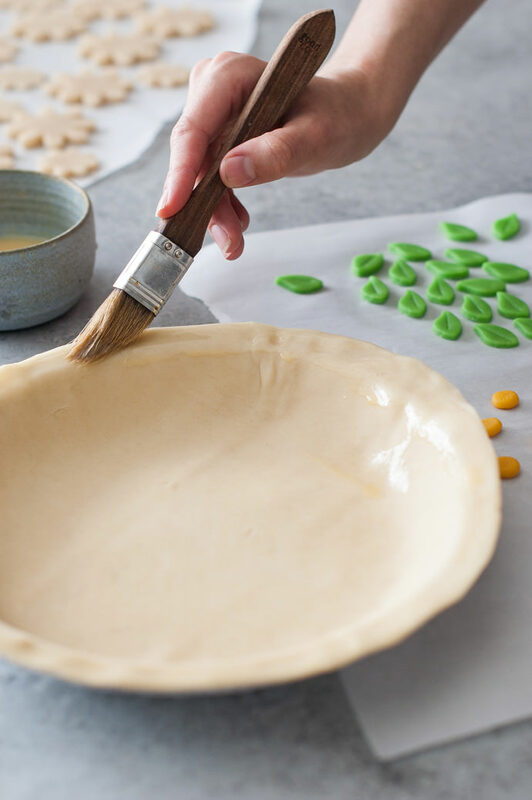 Did you know that you can add color to your pie crusts? True story! 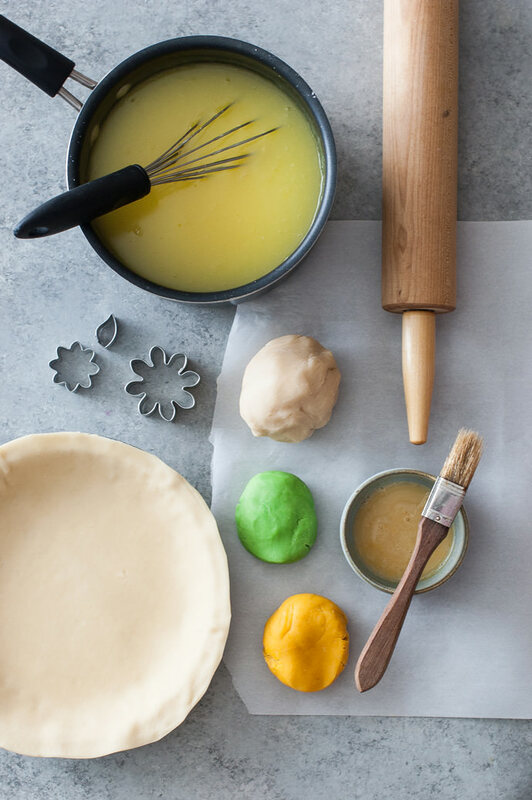 Since coloring has to be kneaded into the dough with can result in a tough crust, it’s best to keep it minimal. 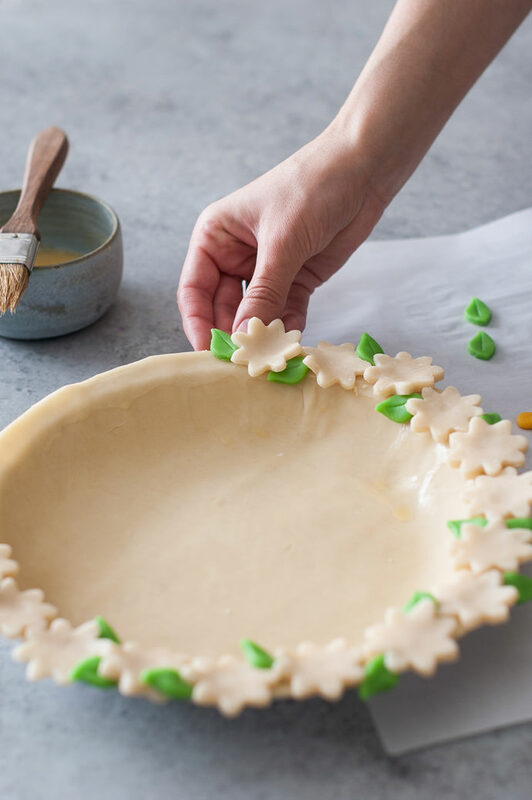 This daisy chain pie crust is the perfect way to add a little color to your pie without serving up a tough crust! 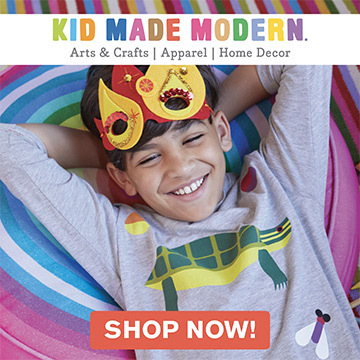 And isn’t it so very perfect for the spring months?! 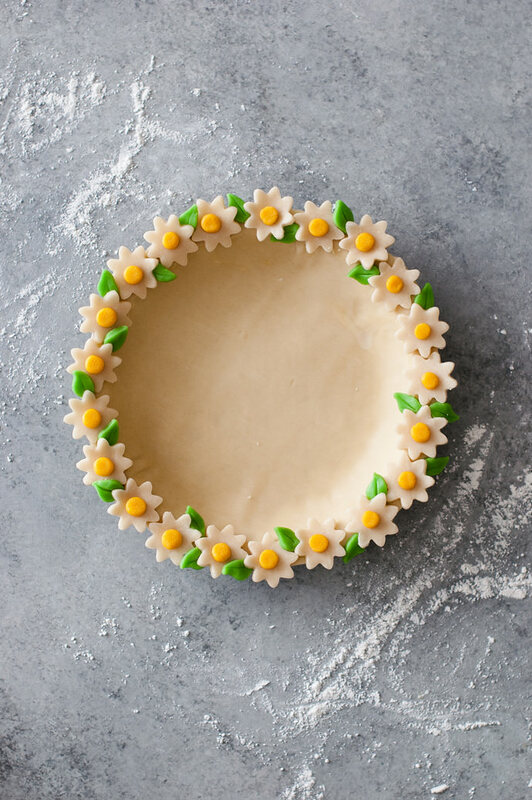 A touch of green leaves and little yellow flower centers make for the sweetest little pie. Since this crust is baked before being filled, it’s perfect for a lemon meringue pie or any other pie that uses a pre-made filling. 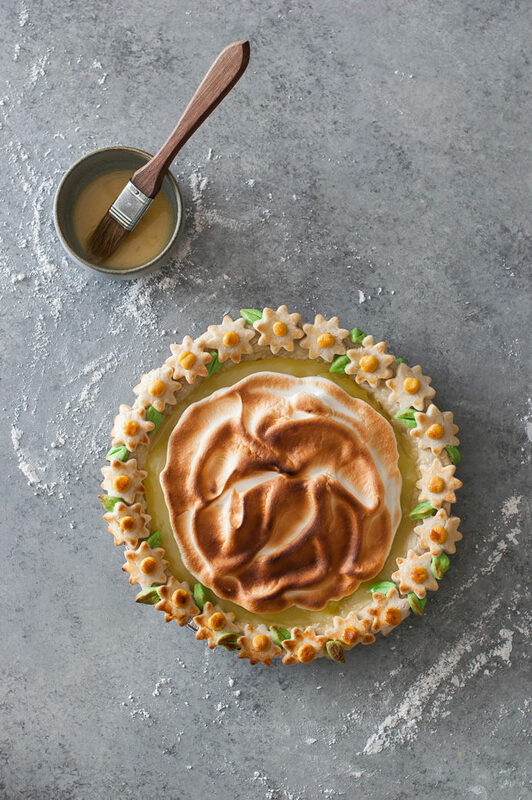 If you add meringue to the top, just cover the crust edges with tinfoil to keep them from browning too much while you broil the top of the meringue. Divide the dough in half. Roll one half into a ball and place on a sheet of parchment paper. Dust lightly with flour and cover with another sheet of parchment paper. 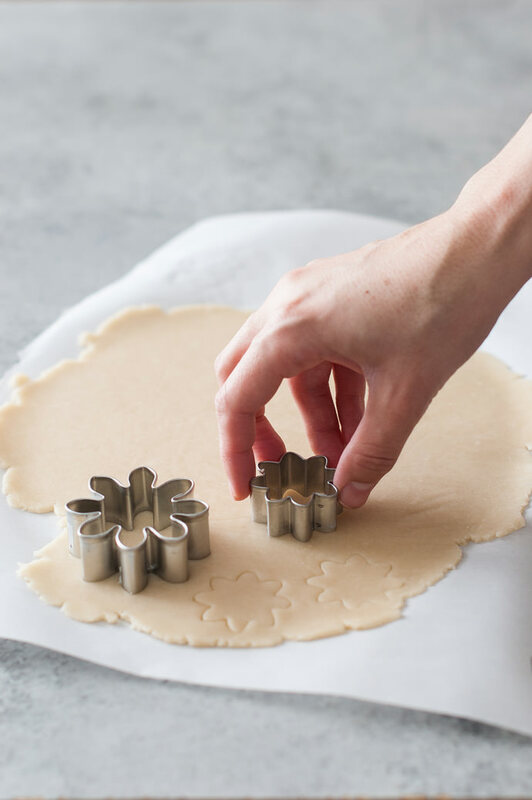 Roll dough into a ¼” thick round. Cover pie dish with the round of dough, pressing dough gently into the dish. 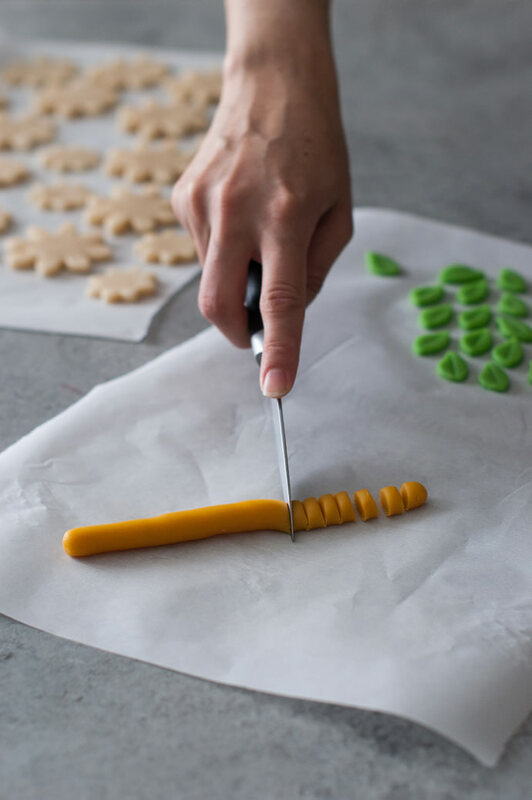 Cut excess dough of the sides with a sharp knife. Cut the other half of the dough in half again. 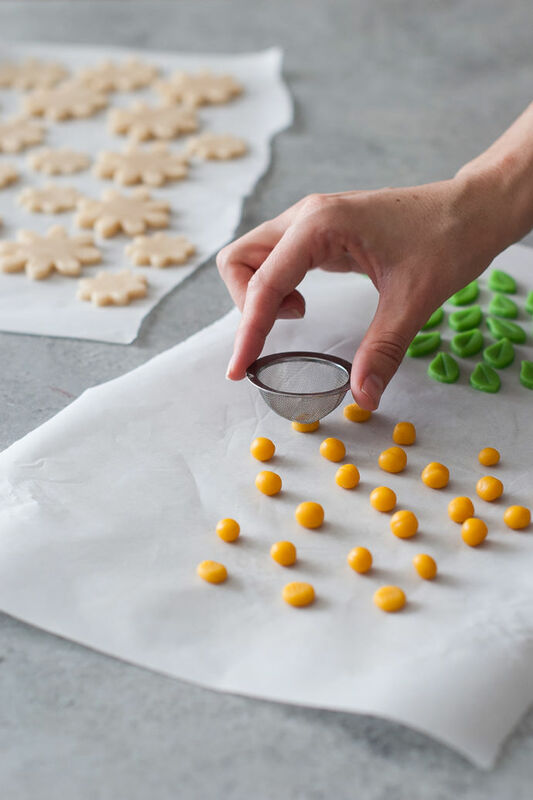 Place one of the halves in between two sheets of parchment paper and roll to a ¼” thickness. Cut about 24 small daisy shapes out of the dough. Discard excess dough. Take the remaining half of dough and cut it in half again. 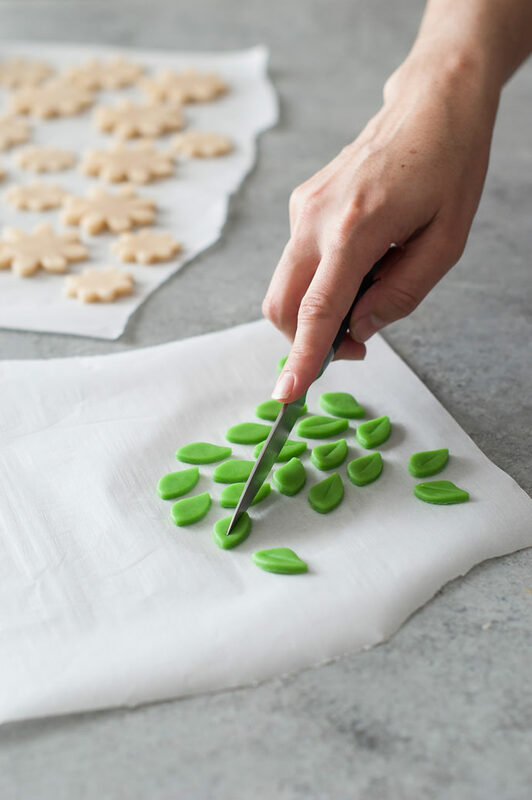 Add a drop of green food coloring to one half and knead until the dough becomes green with no streaks. Add a drop of yellow food coloring to the other dough half and knead until the dough becomes yellow with no streaks. 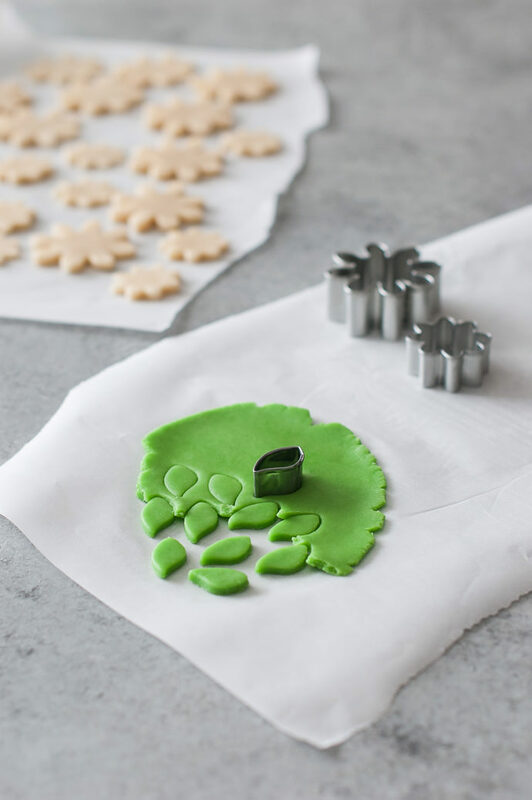 Place the green dough in between two sheets of parchment paper and roll to a ¼” thickness. Remove excess dough and discard. Cut lines into the tops of the leaves using the back of a knife. Roll the yellow dough into a thin log. Cut the log into small, equal sized pieces with a sharp knife. Roll each piece of dough into a ball. Press each ball down with the top of a mesh sieve to leave a cross-hatched imprint in the balls. Brush the top sides of the dough in the pie dish with the beaten egg. 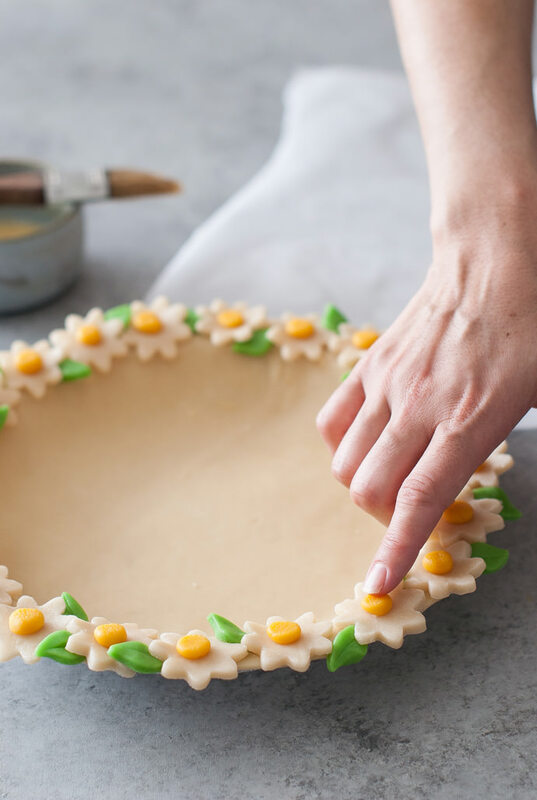 Place daisies along the sides of the egg-brushed dough, inserting the leaves in between each daisy. Make sure flowers don’t hang too far over the edge or they will droop and fall off while cooking. Brush a dab of beaten egg in the center of each daisy. Place a yellow ball in the center of each daisy. Brush the entire crust daisy chain with more beaten egg. Place a sheet of parchment over the pie and press into the center. Fill the parchment with beans. Bake at 375 degrees on the middle shelf of the oven for 20-25 minutes, or until the crust is cooked through. Remove from the oven and let cool. Remove the beans and parchment paper and fill the crust with the desired filling. Makes enough crust for one covered pie. Place the flour, salt, and sugar in the bowl of a food processor. Pulse a few times until combined. Add the shortening and butter and process until the mixture is crumbly. With the food processor running, drizzle in ice water, one tablespoon at a time until the mixture forms a firm dough. Press dough into a ball and wrap in plastic wrap. If not using immediately, store in the fridge. Oh my goodness, that’s absolutely magnificent! I loved pie before this, but now, if possible, I love it even more. That is just so pretty!